Flipkart is holding talks to tie-up with manufacturing clusters such as Tirupur and Ludhiana. 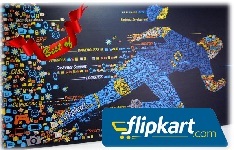 COIMBATORE: Flipkart, the largest e-commerce marketplace in India, today said it is holding talks to tie-up with manufacturing clusters such as Tirupur and Ludhiana as part of bringing more sellers on-board to meet the strong growth in demand. "We are targeting manufacturing clusters and would sign up partnerships with Surat, Agra and Ludhiana, where synthetic apparels and leather items are manufactured," Ankit Nagori, Vice President, marketplace, Flipkart, told reporters here. Stating that the company was in talks with entrepreneurs in Agra and already have more than 100 sellers in Surat on board, he said Flipkart has about 3,000 sellers, most of them from Small and Medium Enterprises. The company, which has already tied-up with the Federation of Indian Micro, Small and Medium Enterprises and National Centre for Design and Product Development, will grow the seller base to 12,000 by the end of this fiscal, he said. Ankit and his team,who were here to hold talks with local trade bodies and entrepreneurs on how online marketplaces can help MSMEs expand their business and brand nationwide, said Flipkart aimed to increase its market-share in the clothing segment to 70 per cent from the present 50 per cent. While the largest Chinese e-commerce marketplace alibaba.com has about 20 lakh SMEs on-board, it is less than 20,000 in India, Anit said Flipkart has 18 million registered users and online retail was expected to touch Rs 50,000 crore by 2016. It was projected to grow at a whopping 50 to 55 per cent per annum for the next three years, he claimed.